The universes have collided and it's all out war! The universes have collided, pitting Klingons against the Star Wars Galactic Empire and others! Originally written for a Klingon fan group's postal 'roleplaying' system. The Something Else group wondered if Klingons smell worse than Jawas, an eternal question that has yet to be resolved. The Buccaneer made a brief foray into the Triangle, as did a Star Wars Bounty Hunter by the name of Death Bringer. The biggest contribution comes from K'Ratalra, the Klingon. The original outline to the triangle RPG game that the stories below are based upon is reprinted here to help you understand the background of theses stories. The Triangle game was devised and run by Martin Ford and Tristrum Walker. We welcome submissions to The Triangle: Eternity War. These are the simple guidelines that will allow you to pen your own action masterpieces to appear here alongside our own efforts! Please feel free to come play in our universe. A loose series that will tell the tale of how the various 'star' characters from each universe contributed to the war. How did all this start? With a bang! Battling missions from the Klingon version of the Triangle. These are the stories written by very person that dragged us into this! All is not well on the Cadassian planet of Siglon 12. K'Ratalra joins the crew of the I.K.V. ghop ta'voDleh to investigate what is going on and attempt to stop it. The architect of the Khitomer massacre has been identified and the Klingon people call for Justice. But for K'Ratalra, blood calls for blood. The Eternity War hots up and the I.K.V. ghop Ta'voDleh is among the first to draw blood. On a colony world now in enemy space, there is an agent with important information. It is up to K'Ratalra to get him out. But the actions of the I.K.V. ghop ta'voDleh must be anything but futile. A Klingon councillor has been taken and the I.K.V. ghop ta'voDleh is one of the only ships in the area. K'Ratalra mounts a desperate rescue attempt. But is it just what the enemy wants? The New Order goes on the offensive. The crew is gone and K'Rontep has to make sure their souls get to Sto-Vo-Korh. Presented here for your reading pleasure is a couple of reports for the rpg by mail from the "Something Else" fan group. They aren't as detailed as the usual stuff but they were never meant to be. The second one is in response to an advert for a Vorlon Liason Officer, included is the application form I came up with for it. Sadly, just after we joined and sent in the application, the rules were changed preventing Gallifreyan help with their problems. 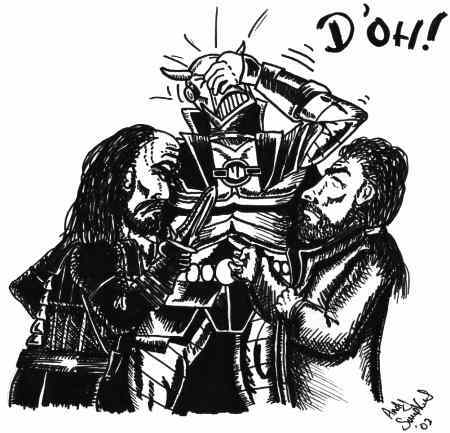 We still think that the Klingon General just couldn't handle Mac...wiiiimmmmmppp!!!! A CVE? Nope, don't think so. Macfadyan and co. end up in a place where pasties are a fashion accessory and where shadows have a habit of moving when you least expect them to. Gissa job! Go on, I can do that. I can liaise with a Vorlon. Go on. Gissa job. Gissa it!!! Join United Nations Intelligence Taskforce officer Captain Colin Curtis as he battles the alien nasties of The Triangle! Captain Curtis gets into double trouble when he finds himself stranded in The Triangle! Follow the highs and lows of a mechanoid, originally from the Star Wars universe, now somewhat aggrieved to find himself trapped in The Triangle! Laugh at his misfortune and his desperate attempts to make a quick buck or two along the way. Our favorite Freelance Peace-keeping Agent finds himself somewhat peeved at having his ship shot out of the sky and nasally distressed when he meets Klingons for the first time. A Mechanoid, an irritating kid, a psychotic Klingon, a Bounty Hunter and a quiet little Imperial Garrison feel the heat. A Mechanoid, an irritating kid, a Federation President and the end of an era? A view from the other side. Can Earth's complacent security forces stop a lone gunman intent on murder? The civilian carnage has began. Dilon and a mad old friend go in search of their fallen hero but what will they discover on their journey? Starfleet stumble into an ancient nightmare and twilight comes to Betazed. The return of an old friend and a sign of things to come.